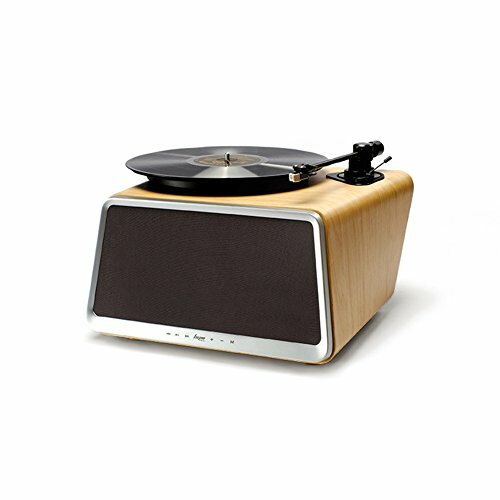 This all-in-one modern smart player smoothly integrates Hi-Fi sound with convenience and tone quality,More than just a turntable. Seed features an all-in-one built-in design, integrating the functions of player, power amplifier,and loudspeaker plus more,and produces clean and full sound, providing a compact design with high-quality music experience without complications. Our team spent two years developing the three-point suspension system of high stability, utilizing an interference-free, small space for the reading platter. Vinyl plays stably, and provide the original, true sound of whatever music style you choose, even when operated at high power. Besides playing vinyl, Seed is compatible with wireless remote play for mobile phones, tablets, and computers. You can now enjoy the convenience of digital music with Seed while lounging and relaxing, free from cumbersome, larger devices. 2.Tonearm:9"oil seal stationary shaft horizontal double pole patented suspension straight bar tonearm with Audio Technica cartridge, offering the best horizontal tracking angle and vertical tracking angle. 3.Motor:12-pole coil ultra-silence 300 RPM slow-speed revolution large torque 12V/350mA brushless direct current motor, supporting 33 1/3 and 45 revolution platter revolving speed adjustment and constant speed locking, providing start-stop control. 4.Platter:1000g high-precision aluminum casting double-layer flywheel turntable,offering the best constant revolving speed. 【All in One Design】LP, Speaker and Amplifier All in One Smart Vinyl Records Turntable Audio Station with Touch Control Switches and Remote Control. 【HiFi Speakers】Built in Two 1" Tweeter and Two 4" Woofer Drivers, Dynamic Range is Increased by 20%, Sound Output is 80W without Crackles and Pops. 【Patented Design】The Unique Patented Tri-Point Suspension Design System Keeps the Stylus Riding in the Grooves to Read the Music Accurately. 【Smart Turntable Audio Station】Supports 33 1/3, 45 Speed and Plays All of Your Vinyl Records and Favorite Albums, Supports AUX-in, Wi-Fi,USB, Bluetooth and Airplay, and Can Stream from Various Web Platforms. 【Elegant Style Design】Perfect Shape Design can Catch Your Eyes at First Sight;Case Material: Natural White Oak Wood;Size:14.96x10.60x13.78IN,GW: 25.18lbs. If you have any questions about this product by HYM Originals, contact us by completing and submitting the form below. If you are looking for a specif part number, please include it with your message.